This chronology has been compiled from excerpts extracted from the EVPA Newsletters. If you have additional background materials to share, please do. On Saturday, October 21st over 20 neighbors worked to clean up and replant Pink Triangle Park at the intersection of Market and 17th Streets. With help from a sheriff’s work crew, DPW, Rec & Park they planted 40 rose bushes and 30 rosemary plants in this first phase of the park’s reclamation. Regan’s Nursery of Hayward generously donated the roses, John of Hortica donated 30 bags of compost, and Long Life Noodledonated lunch. Since then a new pathway through the park has been constructed and an additional 7 rose bushes (thanks Joe) have been planted. Future phases call for the installation of a decorative fence on the 17th Street side and the addition of new trees. At the October meeting Lion reported that Castro Street Fair will be distributing $46,417 among the 15 groups which collected donations at the entrance gates. Update: EVPA will receive $2,114.93 which will be used to improve Pink Triangle Park. Herb, Joe, Mike, Pauline & Gustavo reported on the wonderful transformation that began on Oct. 21st to Pink Triangle Park. A group of EVPA and other volunteers completed a “Big Dig” on Saturday, June 9 in Pink Triangle Park at Castro, Market and 17th Streets. Come see the new rose garden full of pink blooms, and now free of weeds, unwelcome vines, and trash. We had major help from a large SF Dept. of Public Works crew. DPW and other city officials including Wendy Nelder (Mayor’s Neighborhood Beautification Fund) lent their support. Sup. Mark Leno also visited. Artists Susan Martin and Robert Bruce helped complete the on-site layout for 15 pylons in a triangle design. The finished project will be the Pink Triangle Park Memorial to commemorate gay, lesbian, bisexual and transgender victims of the Nazi regime. A temporary version of the sculpture, using wood pylons, will go up in late June, with installation of the permanent memorial later this year. transgendered victims of Hitler’s concentration camps. The public is encouraged to visit the park (especially those in our neighborhood and community) and to send comments, as well as donations, to Pink Triangle Park + Memorial Committee, Box 326, 584 Castro St., San Francisco 94114. Checks can be made payable to “EVPA,” or if you want a tax deduction for your donation, contact PTPM as above for further details. Supporters of the PTPM project include the following neighborhood businesses and organizations: BayView Bank, Bank of America, Blue Restaurant, Regan’s Nursery, Hortica, SF Mayor’s Neighborhood Beautification Fund, Harvey Milk Institute, Sisters of Perpetual Indulgence, and Chat Café. Marble & Granite Being Cut! Columns for Memorial Almost Done. The 15 granite and marble pylons that will make up the Pink Triangle Park memorial are being cut in Minnesota. They will be set at Pink Triangle Park early in December by artists Robert Bruce and Susan Martin. Suggestions for the text to be on the Park’s Plaque are welcome. Consider the following and submit them in writing to PTPM2001@aol.com. How do you think people become the objects of hatred? How has your personal experience with the effects of such hatred changed you? We would like to receive submissions prior to celebrations of the 53rd anniversary of the signing of the U.N. Universal Declaration of Human Rights. The anniversary is December 10 and will involve events throughout San Francisco. Commemoration details for the Pink Triangle Park + Memorial will be made available on www.evpa.org. 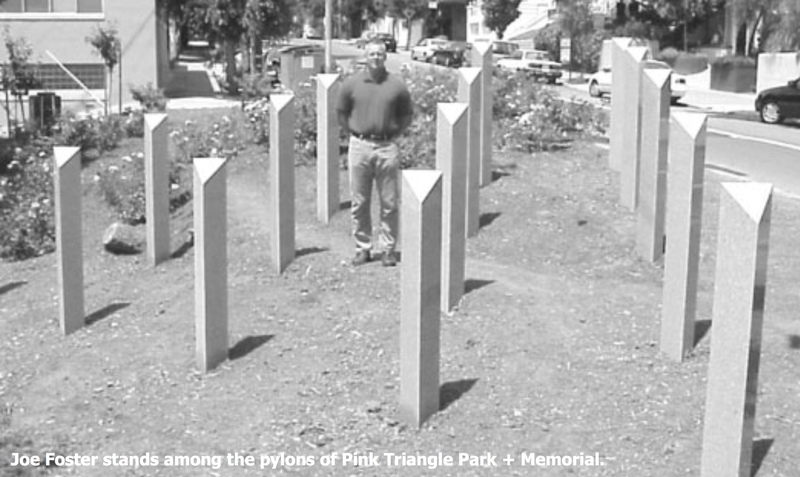 In August of 2000, EVPA became a co-sponsor of the Pink Triangle Park + Memorial Project. 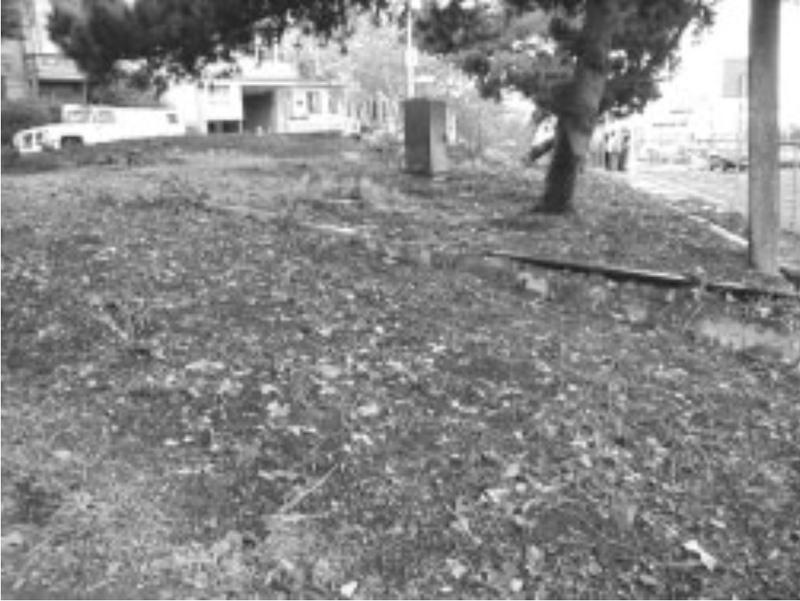 The project is a neighborhood-based effort to clean-up a parcel of city-owned property at the western side of the Castro/Market/17th street intersection. With help from the Department of Public Works and the Mayors’ Neighborhood Beautification Fund and numerous volunteers and business contributors, the Pink Triangle Park has been transformed from vacant lot overgrown with weeds to a beautiful rose garden. Even more exciting is the creation of the Pink Triangle Park, a memorial sculpture dedicated to the GLBT victims of Hitler’s concentration camp system. On December 10, S.F. City Officials honored the 53rd Anniversary of the United Nations Declaration of Human Rights by proclaiming Pink Triangle Park Day at the juncture of Castro, Market, and 17th Streets. The ceremony was the official groundbreaking for the Park and its Memorial of 15 granite pylons commemorating gay and lesbian victims of the Nazi regime. In attendance were California Assemblywoman Carole Migden, President of the Board of Supervisors Tom Ammiano, District 8 Supervisor Mark Leno, and Wendy Nelder of the Mayor’s Office of Neighborhood Beautification. Governor Gray Davis issued a proclamation honoring the day and the work of neighborhood volunteers. One pylon was temporarily installed for the event, but has been moved into storage until the remaining fourteen pylons are ready. The pylons should be ready by April 2002. Congratulations! Thank You, Wells Fargo! Foundation Donates $5K to PTP. Pink Triangle Park has received a $5,000 grant from the Wells Fargo Bank Foundation! Our thanks go to Wells Fargo folks Mario Diaz who helped guide our application through the process, to Pamela Erwin who approved the grant, to our new Castro branch WFB Manager, Chris Befumo. EVPA gratefully acknowledges the support of the WFB Foundation as we create a memorial and park to those lesbians and gays killed in the Holocaust. Thanks also to Herb Cohn and the PTP Committee for writing the grant proposal. And so we put the question out there…Are there any other companies who care to match the WFB contribution? Just asking. The Park and Education Committee reported that the SF Art Commission approved the Pink Triangle Park Memorial. Pink Triangle Park Making Progress. In the meeting minutes, Captain Greg Corrales from Mission Station introduced himself to the membership and answered questions from members. Captain Corrales affirmed his support of the Pink Triangle Park and even though the park is in Park Station’s district, Captain Corrales will consider this small area Mission Station’s responsibility. The Park and Education Committee reported installation of the PTP memorial maquettes is planned for May 6-10, although that may change depending on the construction of a new retaining wall. Springís warm weather brings a burst of EVPA action. Pink Triangle Park co-artist Susan Martin eyes alignment of wood pylons as the permanent granite and marble ones near completion. The heavy columns require a strong base, and if you stop by youíll see the round concrete foundations. Watch for a December dedication event. Pink Triangle Park co-artist Susan Martin eyes alignment of wood pylons as the permanent granite and marble ones near completion. Holocaust Memorial Takes Shape! Sculpture In; Wall Phase Begins. It is a small, oddly shaped piece of land in the heart of the Castro. Thousands of people pass it to catch a bus or underground train. Almost directly above, the brightly striped rainbow flag snaps in the wind. Although in the middle of everything, the lot was overlooked, unremarkable and littered. Its tight triangular boundaries made it impractical for virtually every use. Except for one. For the last two years, this lot has been the site of an ambitious EVPA-sponsored project: to create Pink Triangle Park + Memorial, a place of remembrance for lesbians, gays, bisexuals and transgenders imprisoned or killed during the Nazi regime. In June, PTP+M took a huge step forward with the installation its centerpiece art sculpture. Fifteen sierra white granite pylons now grace the site near Market and Castro. Each pylon is triangular in shape and the arrangement of the pylons forms a larger triangle on the hillside. 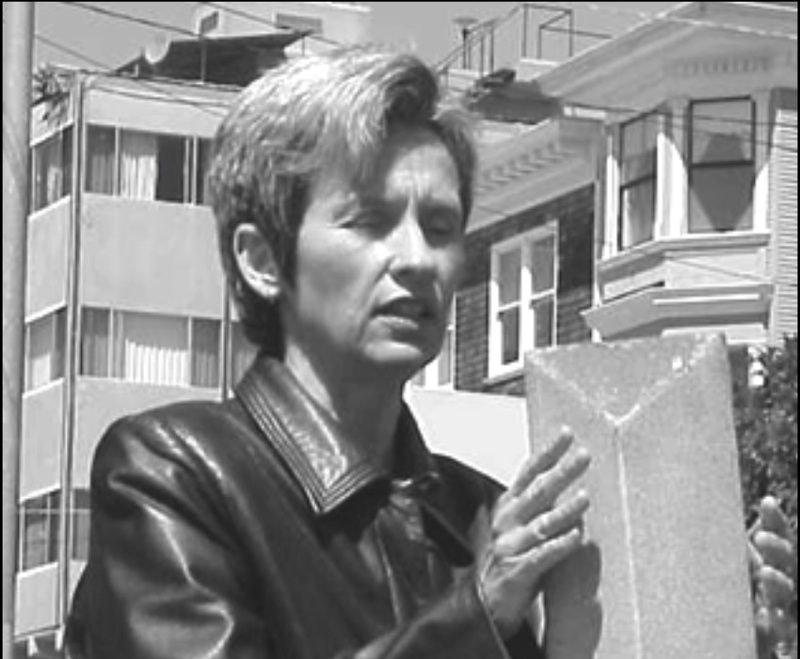 The base of the sculpture is oriented toward the large rainbow flag at Harvey Milk Plaza. Rosemary soon will bloom among the pylons, complimenting the rose bushes planted earlier along the park’s western edge. Attention now turns to completion of the Memorial Wall and related events. The Wall will frame the park’s edge and provide room for future plaques that shed light on LGBT experiences during the Holocaust and after initial liberation from the concentration camps. For example, under Paragraph 175 of the German Penal Code that criminalized gays, persons wearing the pink triangle were re-imprisoned after being freed from the concentration camps by Allied troops. The poignancy of an overlooked lot in the heart of the LGBT community emerging as a prominent memorial to victims who sometimes are overlooked in the tragedy of the Holocaust is not lost on the hard-working volunteers making it happen. The goal is to complete the Wall and nameplate this fall. To do so EVPA is launching a capital campaign effort to raise $50,000. The capital campaign goal includes grant requests, fundraising events and individual donations. There are many ways you can help. When you do, you’ll ensure future generations remember what happened, so it may never be repeated. Encouraging friends and colleagues to attend PTP+M fundraising events such as the wine tasting on July 13th. Turning your next party into a mini- fundraiser by asking guests to make a donation and forwarding those donations to EVPA. Making a personal financial donation. Asking your employer to consider making a contribution, providing a grant, or creating a special event to raise funds. Soliciting items from area merchants to use in a silent auction to be held in conjunction with a screening of the film Paragraph 175. Volunteering to help with the Paragraph 175 film event when the date is announced. Castro Street Fair on Sunday, October 6. A portion of entry proceeds benefit EVPA/PTP+M. If you wish a tax deduction to PTP+M, make your check payable to Harvey Milk Institute and mail it to EVPA with “PTP+M” marked in the comments line. Harvey Milk Institute is the fiscal agent for tax-qualifying donations. If you are not seeking a deduction, make checks payable directly to EVPA with “PTP+M” marked on the comments line. Donations of any amount are appreciated and continue the neighborhood-supported nature of this important site of LGBT history. The Pink Triangle Park sculpture is installed! Congratulations to all those involved in this EVPA and neighborhood project! A motion was made that EVPA accept the remaining tasks associated with PTP from the ad hoc committee founded to select a memorial sculpture, and for EVPA to accept fundraising, operational and maintenance responsibilities for the remainder of the project. The motion passed. A motion was made that development tasks begin under the full auspices of EVPA. Development to include: planning, fundraising and construction of a memorial wall and signage. The motion passed. A motion was made to authorize the Board of Directors to accept bids on behalf of membership, for wall and related construction and to authorize expenditure of deposits by the Treasurer as necessary for initial development. The motion passed. A motion was made to authorize up to $8,000 in “bridge loans” from officers Gustavo Serina and Herb Cohn for completion of memorial sculpture, with repayment to come from fundraising efforts, not membership dues. The motion passed. Wendy Nelder (in back), director, Mayor’s Office of Neighborhood Beautification on the first day of pylon installation with Susan Martin. 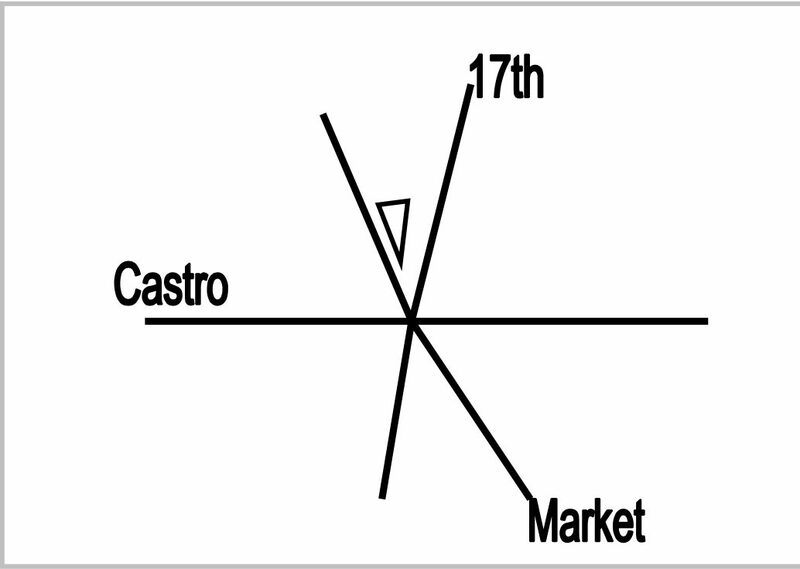 Map showing location of PTP+M near intersection of Castro & Market by former City Athletic Club. Pink Triangle Park Goes Online! Pink Triangle Park, the emerging civil rights park in remembrance of LGBT victims of the Nazi regime, now is online at PinkTrianglePark.org. Click it for an overview, photos, research links or to make a donation online via PayPal. Please tell your friends about PinkTrianglePark.org! to remind visitors of their individual responsibilities as citizens of a democracy. 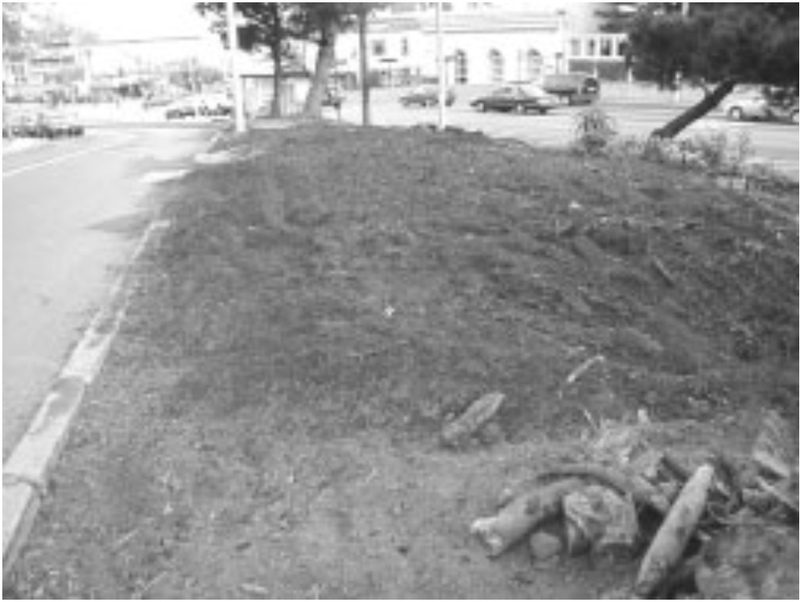 The SFDPW has located 100 surplus rosemary and rubus plants for use in Pink Triangle Park + Memorial. Thanks to DPW and the SF City Nursery for this donation! Volunteer green thumbs planted 190 rubus and rosemary at Pink Triangle Park in September. Pictured: (l) Joe Foster, Christie Allair, Ed Allen and Brenda Hatten. Watch ‘em grow! Art Gets Frame and Revised Name. Work has begun on a concrete retaining wall in the first step toward building a ‘frame’ for the 15 sierra white pylons at the center of Pink Triangle Park + Memorial. The concrete replaces a wooden wall that was deteriorating. 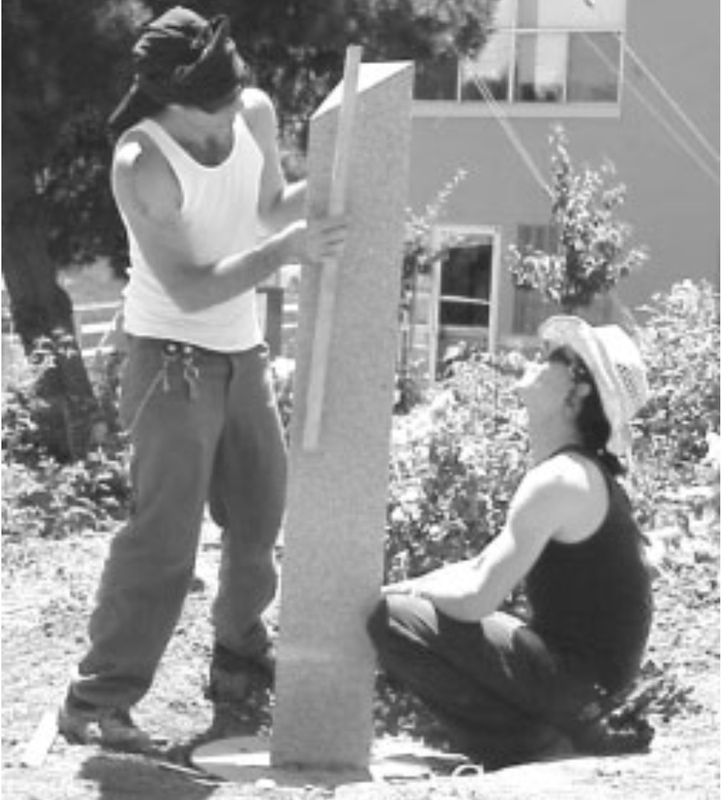 Next year, the Association plans to surface the wall in granite to visually complement the sculptural centerpiece. The Park recognizes LGBT victims of the Nazi regime. Moving forward, the use of the ‘ +’ sign which had been used in Pink Triangle Park + Memorial has been dropped in favor of the word ‘and’ for formal references. The useage will first appear on a plaque for the wall. And so it goes. From the November 2002 Meeting minutes: Park and Ed Report: A concrete retaining wall has been installed at the Pink Triangle Park + Memorial. The next fundraising effort will be for granite sheathing to cover this concrete wall. Castro Street Fair proceeds exceeded $62,000 this year, of which EVPA will receive a portion based upon membership participation in fundraising. Special thanks go to MUMC President Patrick Batt for donating his entire time (some 9 hours!) to EVPA. New Pink Triangle Park Donors. EVPA gratefully acknowledges those who have given $100 or more recently to support our newest park project, Pink Triangle Park + Memorial. Thank you! Work is continuing on signage, a bronze plaque and granite sheathing of the concrete retaining wall at the Pink Triangle Park + Memorial. Pink Triangle Park + Memorial will refocus its available funds for improved landscaping and irrigation, rather than a granite wall to surround the Park. Funds raised to date or pledged covered only 1/3 of the projected wall estimates. The landscaping is expected to be in place for a June ceremony with the Mayor. The Park recognizes LGBT experiences during the Nazi regime. The first incident of vandalism was experienced by the Pink Triangle Park + Memorial. EVPA members Ed Allen and Mike Babbitt contributed to cleaning up this vandalism, and the take away brochures supplied by Michael Crawford and Tom Hanus continue to be a positive form of PR for the park. Efforts are continuing to find a landscape architect who can help with the clean-up of the park prior to the dedication ceremony. EVPA member and board member David Weiss has volunteered to research possible sources for the granite facing proposed on the retaining wall. Pink Triangle Park is alive with activity in preparation for the Official Dedication of America’s first permanent freestanding memorial to LGBT experiences during the Nazi regime. Three years of hard work from inspired volunteers, artists, and diverse membership of EVPA culminate in the Monday, June 23rd dedication, 11:30 am – 12:30 pm. The ceremony will include several Jewish survivors of the concentration camp system (there are no LGBT survivors in the Bay Area from this era), World War II veterans who served in Europe, clergy from neighborhood churches and synagogues, members of the Shoah Foundation who record verbal histories of Holocaust survivors, San Francisco Mayor Willie L. Brown, Jr., Board of Supervisors President Matt Gonzales, Board of Equalization Chairwoman Carole Migden, Supervisor Bevan Dufty whose District 8 includes the Castro and Supervisor Tom Ammiano. Music will be provided by the internationally recognized San Francisco Concert Chorale. The DPW will close the base of 17th street during the event to accommodate the expected overflow crowd. A special thanks to EVPA members Ed Allen, Lion Barnett, Mike Babbitt, Jimmer Cassiol, Erin Day, Joe Foster, Dianne Nutting, Gustavo Serina and Carlos Vasconcelos who have volunteered to assist attendees at the dedication event. More volunteers are still needed so please take a moment to send an email to joinevpa@aol.com if you can help prior to, during or after the event. The Official Dedication takes place one year after the installation of the sculptural centerpiece by artists Susan Martin and Robert Bruce. Since then, the crumbling wooden retaining wall has been replaced, informational posts installed, and now lush landscaping evokes an enviroment of mediation and contemplation on civil rights. Peek inside for an overview of the textured landscaping now embracing the 15 sierra white granite pylons. By now all of our active members should have received their invitations to the June 23, 2003 Dedication Ceremony which marks a significant milestone of a major undertaking by our organization, one that began three years ago. We should all feel very proud. This is what neighbors, working together and in partnership with the city, can accomplish. Special thanks to Vice President Tom Hanus and Membership Chair Michael Crawford for designing and donating the remarkable invitations. Please visit PinktrianglePark.org for links to historical references on LGBT experiences during the Nazi regime, maps and background on the Park, as well as the ability to donate online via PayPal to support ongoing efforts. Joe Foster, Treasurer, announced $25,000 in funds from the Mayor’s Neighborhood Beautification Fund to complete the landscaping project at Pink Triangle Park. He also reported that income and expenses are both slightly behind projections and EVPA remains financially healthy. Education and Recreation Pauline Shaver, chairperson, announced that the Dedication Ceremony will take place on Monday June 23rd at 11:30 am. with Mayor Brown and other officials invited. Pauline said that completion of this work is scheduled for June 18th. She recalled her own experience in the notorious Auschwitz camp as a Jewish teenager witnessing the lines of people entering the crematoriums, with nothing but smoke coming out. Her own death came incredibly near when she and dozens more were forced onto a truck en route to execution fields. She jumped, rolling down an embankment and hiding until she could melt back into a crowd. 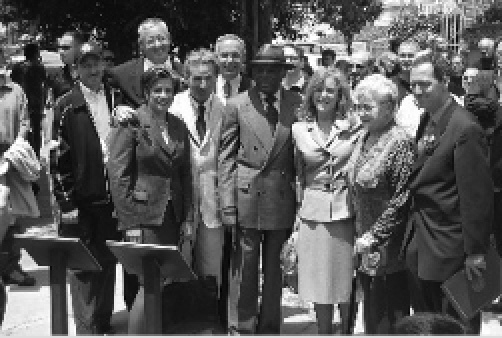 AND THE EUREKA VALLEY PROMOTION ASSOCIATION MAJOR FUNDING PROVIDED BETWEEN 1999 AND 2003 THROUGH THE GENEROSITY AND LEADERSHIP OF WILLIE L. BROWN, JR. Pink Triangle Park + Memorial is open and ready for visitors. It is the nation’s first permanent memorial that focuses exclusively on the experiences of lesbians, gays, bisexuals and transgenders during the Nazi regime. It joins other significant Castro landmarks such as the giant Rainbow Flag, the mural of Harvey Milk above his former camera shop, the site of nation’s first AIDS Quilt Office and, of course, the Castro Theater itself. Though the park is open, the work continues on developing educational outreach materials and fundraising to ensure the park’s proper maintenance of landscaping and sculptural art. EVPA is proud of its principal sponsorship role in transforming a oddly shaped, weedy eyesore into something of national significance. The three-year-long effort that began with a national art competition and continues embodied in the new park could not have occurred without the support of hundreds of hardworking volunteers from the residential and business communities. A few, although no where near all, are recognized in the next column. Oakland Tribune, San Jose Mercury News, Gay.com, Bay Area Reporter, Bay Times, and Spectrum. KGO Channel 7, KRON Channel 4, and KCBS Radio also covered the ceremony. The Pink Triangle Park + Memorial has been a multi-year undertaking helmed by EVPA’s Education and Recreation Committee, first under the chairmanship of Joe Foster and then under the leadership of Pauline Shaver. 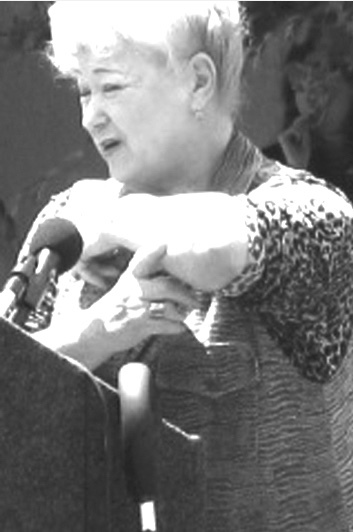 Pauline managed the project from its inception to its current phase. Without her remarkable dedication, it would not have happened. Special thanks to them both and many EVPA members who helped along the way. Members are encouraged to attend our July 17 General Membership meeting, which will feature two special guests: Mayoral candidate Susan Leal, who will share her vision for San Francisco, and a representative of Friends of the Urban Forrest, who will explain how this organization can help in planting more trees in our neighborhood. This a key element of District 8 Supervisor Dufty’s Castro Renaissance plan, which the Department of Public Works is spearheading. 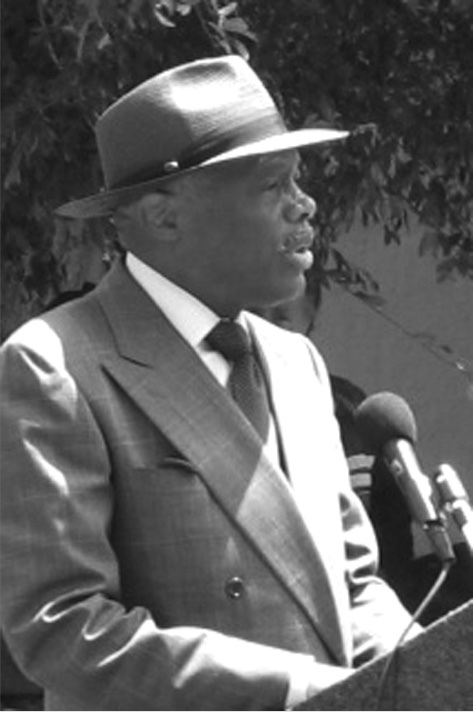 Mayor Willie L. Brown, Jr. speaks at the dedication of Pink Triangle Park. 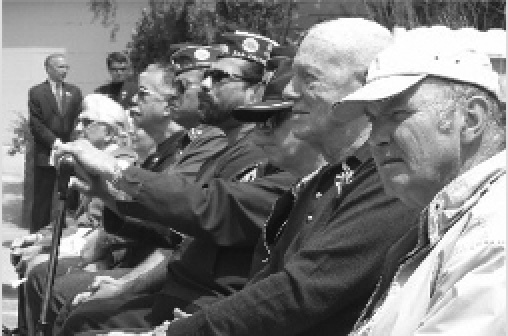 World War II Veterans listened from the front row, including EVPA members (r to l) Jim Compton and Bob Melbourne. Mohammed Nuru, Department of Public Works came to meeting to start a dialog regarding Supervisor Dufty’s “Castro Renaissance.” Lighting designs at Pink Triangle Park+ Memorial, Harvey Milk Plaza and Rainbow Flag located at Market and Castro were briefly discussed. Ongoing PTPM maintenance was discussed, as was early thoughts on how to tell the pink triangle story. Of the many noteworthy achievements of the last two years, the astonishing transformation of the seedy, abandoned space at the intersection of Castro, Market, and 17th Streets into the glorious Pink Triangle Park + Memorial. Our organization worked in partnership with city agencies, primarily the Mayor’s Office of Neighborhood Beautification, headed by Wendy Nelder, and the Department of Public Works, to create something beautiful and spiritual. I thank them and EVPA Treasurer Joe Foster, who first envisioned the potential of the site, and Education & Recreation Committee Chair Pauline Shaver, who managed the undertaking. She not only met our expectations, but exceeded them. Few individuals know how to make dreams come true, and we are fortunate that Pauline is one of them. Thanks as well to artists Robert Bruce, Susan Martin, and landscape architect Jason Rowe for donating their remarkable talents and time to this project. Thanks to EVPA member Ed Allen for arranging the festive and informative New Year event at Pink Triangle Park + Memorial. He and Ed and Rec Committee member Diane Nutting provided hot cider and cookies to the group who gathered to learn about the care and maintenance of roses. Thanks to Ken Gourley and his apprentice for sharing their knowledge of how roses are classified, the natural cycle of roses, why and when pruning is needed. They also started the park maintenance on a proper note this year by pruning the rose bushes with the help of Jack Keating along with Ed and Diane. Exciting news, too, from the guidebook publisher Fodor’s. The 2005 Fodor’s Guide to San Francisco is being updated to include the Pink Triangle Park + Memorial. A Fodor’s representative contacted Gustavo Serina, who is providing the necessary information. Congratulations to all who brought PTP+M to fruition! David Weiss reported that member Marc Epstein, an attorney, informed him that EVPA would not qualify as a 501(c)(3) organization, but that the Pink Triangle Park + Memorial would, and he would look into what that would entail. As a 501(c)(3), the PTP+M could accept tax deductible donations without using a fiscal agent. Ed &Rec Chair Pauline Shaver discussed scheduled springtime work at Pink Triangle Park + Memorial. The return of homeless people to sleep/camp out at the PTP+M was discussed. National corporations such as American Express support neighborhood groups with grants for specific projects such as Pink Triangle Park + Memorial. EVPA member Jack Keating organized and extraordinary day that started at PTPM for his American Express colleagues and you can read details of the event in this newsletter. As part of the Bay Area’s Make a Difference month activities, local Amex employees, led by EVPA member Jack Keating, conducted a Civil Rights hike and park clean-up in San Francisco. Sunday, April 18th was Holocaust Remembrance Day. In honor of the violated civil rights of many people around the world, the group – along with EVPA members Diane Nutting and Justine del Vasareo — spent time cleaning up at the Pink Triangle Park + Memorial and then proceeded on a four-mile urban hike to the top of Mt. Davidson and the giant cross commemorating the Armenian genocide. EVPA is not a 501(c)(3) organization, so donations are not tax-deductible. To accept tax-deductible donations, we need a fiscal agent. Motion to approve the San Francisco LGBT Community Center (the “Center”) as fiscal agent for EVPA: Approve the use of the Center as Fiscal Agent for EVPA to handle receipt of donations from individuals, corporations, public agencies, and other parties to support the Pink Triangle Park, Seward Street Mini Park and Slide, and other EVPA activities. Approval is contingent upon reaching a satisfactory arrangement with the Center regarding processing of donations. Membership authorizes Board Member Gustavo Serina to negotiate on its behalf with the Center to reach agreement regarding proce dural, record keeping, disbursement, fees, and other relevant issues. Gustavo Serina will report back to the Board and General Membership regarding final agreement. Discussion: It is understood that there is a fee associated with having the Center as Fiscal Agent of 10% per grant/check received. Discussion: Since EVPA itself does not qualify as a charitable organization, we should look into qualifying Pink Triangle Park as a 501(c)(3) in the future and have a project of raising money to pay for the costs of setting it up. Motion to approve the Center as Fiscal Agent passed. Work has begun for the installation of lighting of the pylons in Pink Triangle Park. The lights themselves will be installed at a later date. At the May membership meeting EVPA resolves to spend $75 and borrow $800 from board member, David Weiss for a 12-month period in pursuit of 501(c)(3) tax status for the Pink Triangle Park + Memorial project. EVPA directs its corresponding secretary to send a letter of thanks to Mark Epstein for his efforts in obtaining 501(c)(3) tax status for the Pink Triangle Park + Memorial project. If you have walked through the Pink Triangle Park + Memorial lately, you may have noticed some changes. The PTPM team has been working diligently this winter to prepare the park for spring. The oversized Flax and Salvia are being replaced with new plants, including 22 roses that were donated by Gregg Lowery of Vintage Gardens in Sebastopol. Gregg hand-picked roses for our climate based on his extensive experience. There are floribundas, hybrid musks, and polyanthas. Names such as Pink-a-Boo, Cornelia, Felicia, and Pink Prosperity will now grace our park. Additionally, some grasses and other smaller plants have been added to the park. Please stop by and enjoy the park sometime soon! It is located at the northwest corner of the Market/Castro Street intersection, just off of 17th Street. At the general membership meeting, the membership approved a motion to send a letter to the organizers of “Friends of Triangle Park” stating that such a change to the name for Corbett Park (at 17th and Corbett) would create a conflict of interest with Pink Triangle Park. Prior to sending a written memo, Amanda Kahn of Supervisor Dufty’s office, will contact them informally to see if they will use a non-conflicting name. Moved and seconded. Motion carried. and conference rooms and act as a satellite to the main office.” Zephyr’s 2500 Market Street office is scheduled to open early September. 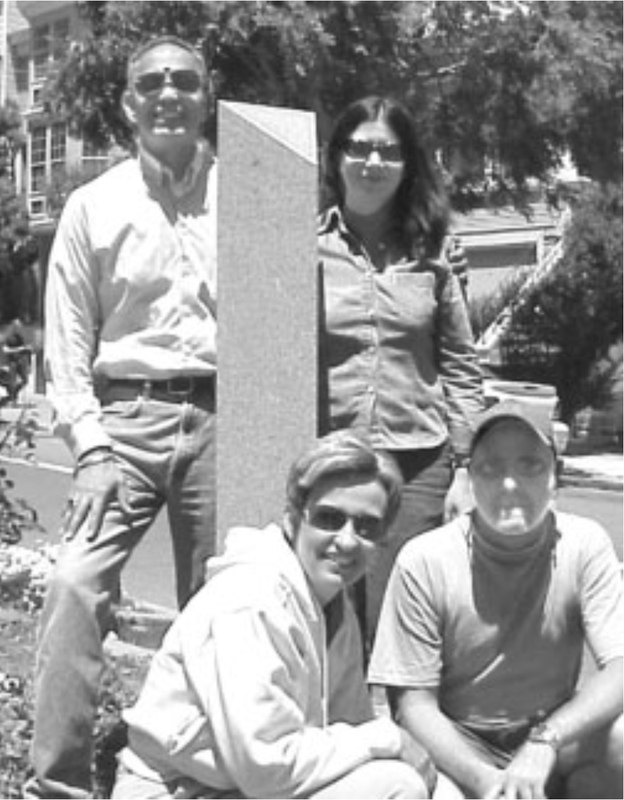 As a result of a 2003 grant application, EVPA has been awarded $1,400 from the Mayor’s Neighborhood Beautification Fund for improvements to the Pink Triangle Park + Memorial at the Market/Castro/17th Street intersection. We are grateful to Lanita Enriquez, Program Director, and the Fund’s Board for selecting us for this award. The award will fund continuing improvements at the park, including new plants, bark mulch, repairs to the irrigation system, and other maintenance items. We are excited to be sprucing up the park in time for Gay Pride weekend later in the month, a time when many people visit our neighborhood, and hope you will all visit and enjoy the blooming roses and sculpture when you are in the area. When combined with the $400 generously allocated to the park via EVPA’s 2005 budgeting process, the Neighborhood Beautification award will serve as a base to continue the ongoing maintenance of this unique park and memorial. On December 17th, several EVPA members headed north to Sebastopol to present Gregg Lowery of Vintage Gardens with a plaque symbolizing our appreciation of his generous gifts of roses to the Pink Triangle Park + Memorial at the intersection of Market, 17th, and Castro Streets. 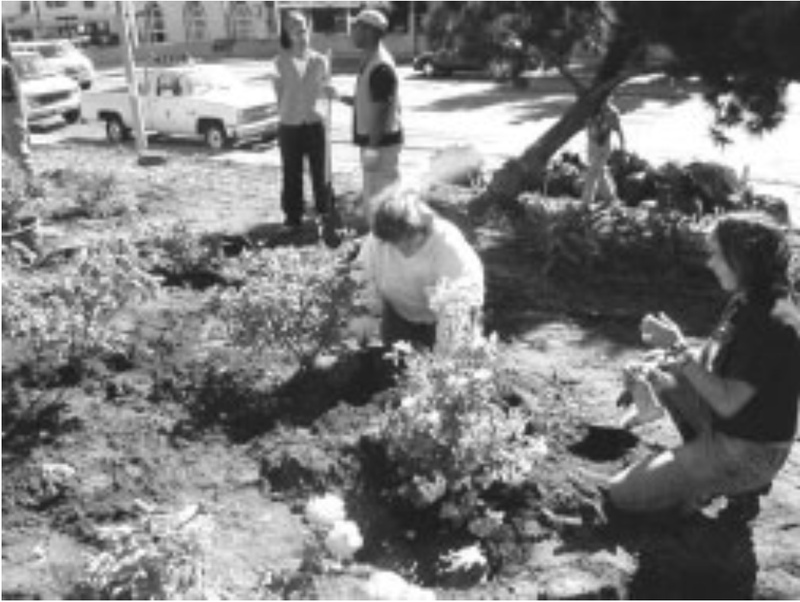 A former Eureka Valley resident, Gregg began his professional gardening career by leasing a vacant lot and growing flowers to sell at San Francisco’s Flower Mart. As his business grew, Gregg and his partner Phillip moved to Sonoma County, which afforded them more room to meet growing demand. EVPA thanks Alejandro Merton for his generous donation to the Pink Triangle Park + Memorial. We are grateful for Mr. Merton’s support of the first free standing memorial to gay and lesbian victims of the Nazi Regime. His donation will help keep the park in first rate condition. Thank you again, Mr. Merton! 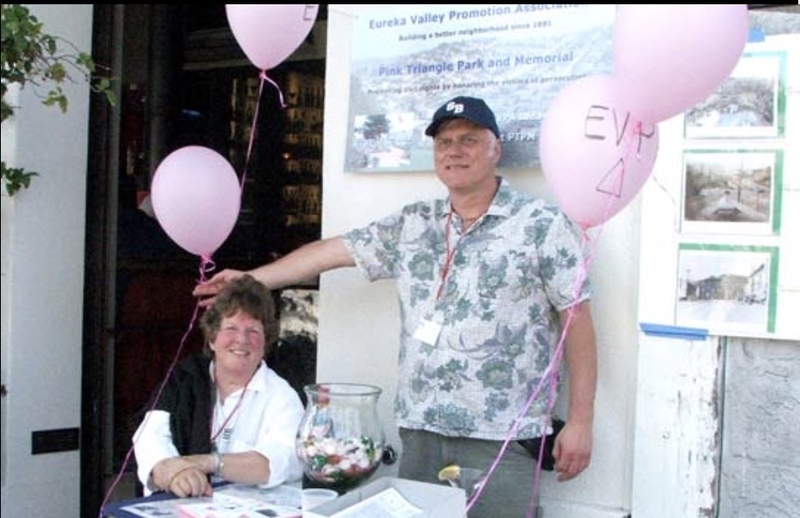 EVPA Treasurer and Board Member David Weiss has graciously agreed to place a table outside his restaurant, Catch, on Pink Saturday (June 24) to provide information about the Pink Triangle Park + Memorial and to get new members to join our organization. We will need volunteers to staff it from noon until 8PM. Details will be discussed at the next General Membership meeting. EVPA members Diane Nutting, Vincent Greene (not pictured) and EVPA president Frank Weiss greeted passerby’s on Pink Saturday outside Catch Restaurant on Market Street. 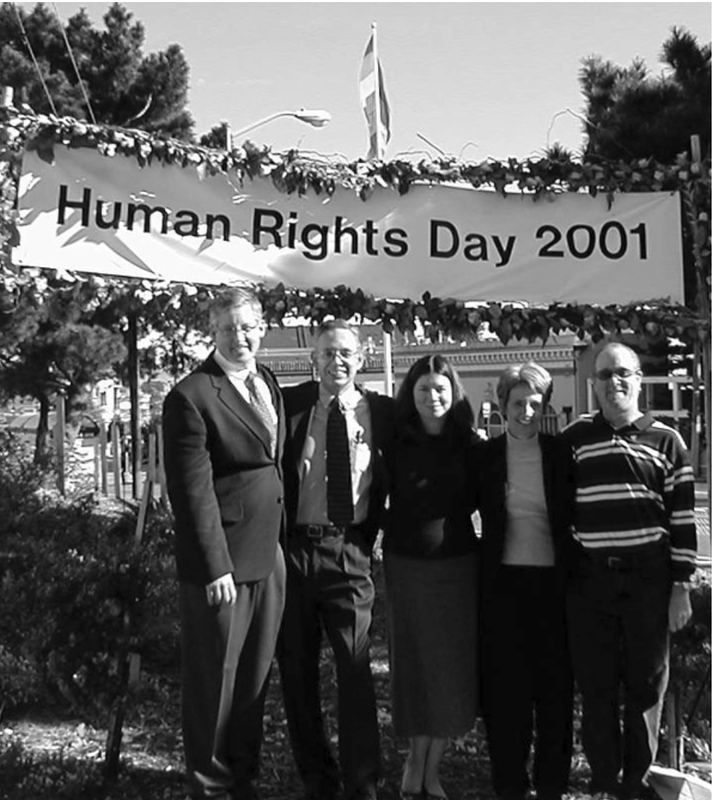 In 2004, EVPA made plans to create a non-profit foundation to raise funds for the Pink Triangle Park + Memorial and other philanthropic neighborhood projects. This foundation will be set up with 501c3 tax status so that donors can deduct their contributions. Many employers, such as Gumps and American Express, have matching funds plans for their employees. The foundation will also be able to accept the annual donation from the Castro Street Fair directly. In the past, we have used other organizations, such as the LGBT Center and the CBD, as fiscal agents. In order to complete the paper work for this foundation, I have enlisted the professional services of Steve Desdier. Steve is the President of Desco Accounting & Tax Service at 4111 18th Street. He has set up 501c3 entities for several other neighborhood groups. The board recommends that the EVPA pay his discounted fee of up to $600, plus filing expenses. I will make a motion for this at the next membership meeting and answer any questions. 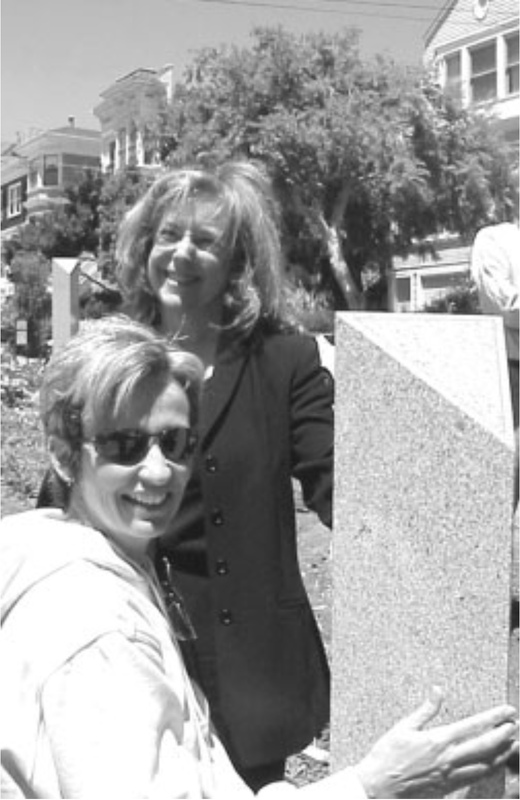 A recent spate of vandalism at the EVPA sponsored Pink Triangle Park + Memorial is being addressed by neighbors, District 8 Supervisor Bevan Dufty, and appropriate San Francisco City Agencies. Among other problems, the posts holding the dedication plaques were knocked down and graffiti sprayed on the retaining wall. Thanks to the fine volunteer work of EVPA members Diane Nutting, Jack Keating, and Justin del Versano, the damage has been mitigated and longer term solutions are being considered. Replacement of the burnt out overhead light should also help. The PTP+M is unique in America and an important part of our neighborhood. Please report any suspicious activity to the police. Long time EVPA member Diane Nutting recently raised $240 for the Pink Triangle Park + Memorial by holding a fundraiser with Magnet, the men’s health clinic on 18th Street near Castro Street. Many thanks, Diane, for ceaseless work on behalf of the PTP+M and to Steve Gipson of Magnet. Chris Hastings, the owner of The Lookout (the old Metro at the intersections of Market, 16th Street, and Noe Street) donated $100 to EVPA for the PTP+M. Thank you, Chris, for joining EVPA. The Lookout will specialize in pizzas. Welcome to the neighborhood! Eureka Valley Foundation is determined to be Tax Exempt by IRS. Eureka Valley has so many interesting points to explore, and one of them is the Pink Triangle Park + Memorial (PTP+M) at the intersection of Castro/ Market/17th Streets. In 2000, a number of neighbors “took over” what had become a blighted triangle of public space. They planted roses, cleaned up the area, and embarked on a mission to create a lasting memorial to the homosexual victims of the Nazi regime, an estimated 15,000 of which were lost in concentration camps. These oppressed people were required to wear the Nazi’s symbol of gay shame – the pink triangle. the lawn, path, and trees we can all can enjoy year round. Since its dedication by Willie Brown in 2001, the park has been maintained regularly by several neighbors and EVPA members. This effort includes care of the 50+ roses, trees, plantings and lawn, as well as cleaning up garbage, graf ti and other improvements. Neighbors are always welcome to join in the maintenance of the park or simply to stop by and enjoy its beauty. Winter time is when the park rejuvenates itself for spring. Roses will be pruned, fertilized, and other annual maintenance tasks carried out. In 2008, PTPM became a 501(c)(3) non-profit, so donations are tax deductible. If you are interested in organizing fundraising efforts or public relations for the park, please come forward! The park is currently supported by donations from patrons as well as from funds from EVPA. A long-term goal is to make the park a self-supporting entity. The PTPM is a unique memorial in the United States and one of the largest memorials to the gay/lesbian/transgender community in the world. It is truly a place to remember that the battle for human rights is an ever-evolving struggle, and one that requires awareness, regardless of one’s gender, ethnicity or walk of life. PTPM, just steps from Castro, provides a beautiful place to re ect and honor the memories of gays lost to the Holocaust.